You’re the one thing I just can’t get enough of. I’ll tell you something, it could be blog love. Always liked Dirty Dancing’s message that nothing is impossible (well, except a sequel with Patrick Swayze…or Jennifer Grey’s original nose). And that nobody should put me in a corner, unless I paint myself in (true story). 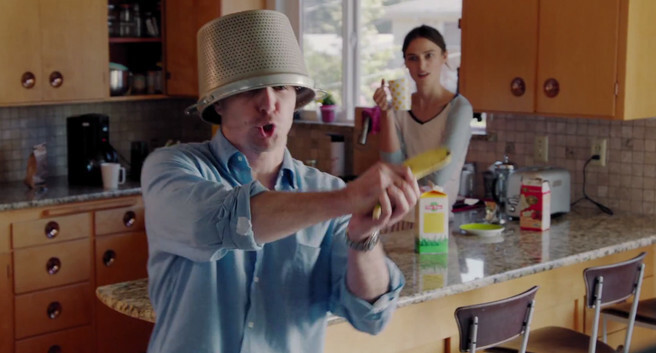 Which lead me to Laggies, ok Sam Rockwell lead me there, but intrigued and entertained, I stayed. Kiera Knightley plays a quirky woman (no surprise, but this time, no British accent, way to step out there) who too often waits for others to make decisions for her. Instead of living life according to someone else’s schedule, beliefs, and dreams she decides to follow her heart, her dreams, and finds a her version of happiness. 1. Company from out-of-town, got them hooked on Haven, muhahaha…also, food involved. 2. Realized people would be 500lbs if they ate as much food as the characters in Joanne Fluke books. 3. Read a great book on memory…can’t remember the title. 4. Re-pledged undying allegiance to public libraries. 5. Thought about taking up knitting….hmm, instead read a book about women in a knitting club, close enough. 6. Read Beekeeping for Dummies…I have more chance of being a bee than a beekeeper apparently. 7. Tried not to second guess myself, wait, unless that’s a bad idea. 1. Had a zen moment where I just felt floaty – good job remembering not to do this while driving or operating heavy machinery. 3. Dental emergency – I know I’ve always tried to be good to you, teeth, but I’ll redouble my efforts. 4. Pain from dental work, watched The Originals and thought, do vampires need dental work? 5. Some pain, not as much as Orphan Black (wow, Tatiana Maslany playing endless clones just never gets boring), had me revisiting The Island of Dr. Moreau, did I almost forgot how epic H.G. Wells was? 6. Went to mall and yard sales, not sure which were more surreal, people buying junk or selling it. 7. Watched Fear The Walking Dead, really, like anyone would notice the zombie apocalypse that quickly these days, especially in LA. 1. Haters gonna hate, but they’re just noise, listened to the good stuff instead. 2. Lost more of my baby weight, sure, my baby’s 17, but better late than never, right? 3. Computer’s dying; it has Windows Vista if that gives you any idea of it’s age. Looked for new one. 4. Worried excessively about passing driving test until I noticed I had chocolate…feeling fine. 5. Passed my last driving test, yup, you can teach an old dog new tricks. They’re dreadfully obsessed with parallel parking, so this is about parallel posting, aka, please leave your link here (in the comment section – any post) for others to find to celebrate with me. 6. Saw a music video that made me wonder if I’d been dancing incorrectly for years as my underwear doesn’t show. 7. Master of Horror Wes Craven, died. 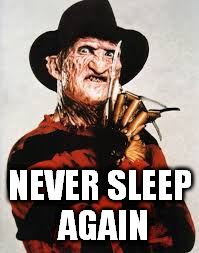 I always wondered, could some of my insomnia stem from watching Nightmare of Elm Street? 1. Spent time chatting online with Microsoft; quickly realized I knew more than they did. 2. Reminded again how wonderful and brave my son is. 3. Sang Nothing Compares 2 U, out loud, thinking of my blogging friends. 4. Oh, so that’s what it sounds like when the doves cry. 5. Thought about what I’m going to do next, writing wise. 6. Made a bouquet of pencils. 7. Wrote more emails to politicians and news people. Remember, it’s just an illusion the world is racing past, go at the speed that makes you happy. Have the time of your life. You’re welcome! So far, it’s just getting started so it’s been relatively uneventful. I hope it’s been good to you too! Jennifer Grey’s career took a nosedive when she had surgery on it! Yes! I thought she looked as what you said! Same me wondering why would people go rearranging their faces! What a shame! Golly Moses! I got dizzy just reading about all your accomplishments. I can’t remember if I read the memory book so clearly it wasn’t a waste of time, right? I think you might be right about the Microsoft help desk – scary isn’t it? Bouquet of pencils, really. Best image there darling. Hmm maybe I could borrow that sometime…. fall on to a bouquet of pencils or pushed? I’m thinking domestic dispute, or horrible accident to deserving character. I’m always looking for a way to creatively work a story line. Yes, it would be a lovely ironic end for a writer or artist, don’t you think? Gets the point, that’s great! I’ll let you know. I’m sharpening the type 2 line. If there are too many refills, it’ll come across mechanical. Burning through it, it’ll be charcoal. Fear not there will be a lead character. Hope your characters don’t end up too sketchy. You lost some baby weight? I think I found it … do you want it back? Great post – that was so funny about the zombie apocalypse in LA – so true – would never know the difference. 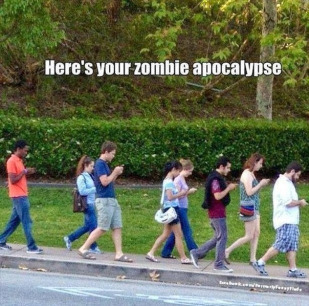 And most people wouldn’t notice until it was too late that the zombies were upon them – too busy staring at those darn telephones. Still trying to lose baby fat plus more(my youngest is 17 as well). What’s your secret – I know diet and exercise. Isn’t there any other way? Yes, sadly these zombie shows no longer have the impact they once did know that it’s actually happening. This way gets them extra fees, right? Dirty Dancing was a great film, I agree. You made me laugh again, I just love your humor. It is and so glad I could make you laugh. Hey, that’s awesome!!! What a great post positivity, encouragement, moving on, breaking out, treating yourself well… and so much more. Amazing! Congrats! Donna you’re adorable and very very funny. I love your happiness project, Donna. Thanks for the update. I hope it keeps you feeling happy and sassy! (Parallel parking… ugh… and THREE tests? Yikes.) Congratulations! Well done. Wishing you a sublime Sunday. Mega hugs! Seriously, congrats on passing the tests — and first try. Next week I have training (3 full days) on a technology process thingie (in which i have no interest, and will probably never use, but it’s required of me just the same) and a certification exam at the end… So i hope i can channel you and pass first time! 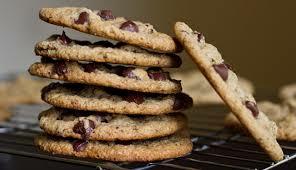 As always, I devour your posts; insights, wit, and fun. Mega hugs. Love this post….it’s like being there…just saying. How is it that you make ordinary life seem so unordinary? As always, I loved this. Thanks for all the laughs. Number 3 is definitely something I would do. Lol! 😉 Thanks, you too! 1) What? They’re making a sequel to Dirty Dancing starring Jennifer Gray’s original nose? 2) Tatiana Maslany may just be the new Meryl Streep. 3) How is Fear of the Walking Dead? We DVR’d it, but haven’t watched yet. 4) Can’t wait to tell all my friends about the new Dirty Dancing sequel. Bye! 1) I think they’re making a remake of Dirty Dancing, but sorry, the sequel would be a grave mistake (too soon?). 2) Meryl Streep is supposed to be The Empress in the Star Wars/Orphan Black crossover, Orphan Black: Clone Wars. 3) I haven’t been excited about FearTWD so far, but that could be a distinct lack of Norman Reedus/Daryl Dixon. 4) I hope your friends are thrilled by your inside knowledge of the DD sequel. 😉 Bye! Jennifer Gray’s nose may just be the new Tatiana Maslany! Noses, hmmm, like clones…I wonder how many there are? I may be the only female I know in my age range who does not love Dirty Dancing. It’s ok. I guess. And even then, it’s all about the soundtrack. I know what you mean, I never got Ghost…I guess that’s the great part about movies, there are so many there’s something for everyone…and the soundtrack was cool. Thank you kindly for the reblog, OM. We truly are the reality of of our imagination as we can inspire and conspire to be what ever we were meant to be, sometimes good and sometimes naughty (never like the word evil go to bad sometimes). But you conjure up a blogging miracle in your posts – paint a picture in our mind and remind us the past and future in your words. You also deserve all the compliments on your posts – so much work goes into them and they need sharing again and again. If l inspire you to write more keeeeeep on blogggggging – that’s a play on words from Strictly come dancing in the UK. When I’m feeling down, I come around, cause you rock Yada! I can’t think of anyone that would be more fun! Thank you D! You’re having way too much fun! Thank you for letting me tag along vicariously for your busy week and laugh along the way. Three tests? Geez. In the UK one written one practical and bugger all parallel parking when I did it. We have this thing we have to learn called the Highway Code – mostly about (1) the different types of lines on the road and how you don’t stand a chance if you’re colour blind (2) when and when not to hug a cyclist (3) why traffic always goes more slowly if the police direct it than if they leave the motorists to figure out what to do when the traffic lights break down. These days its 500 pages; when I did it it was about 70. In my desk I have the one my mother was given in 1945 when she learnt to drive – three pages. I think the same thing has happened to the value of money and average waists. Love the positive vibe here. And this the “zombie apocalypse” picture. 😀 Can I laugh even though it’s sad and true and so not funny? Laggies! Good flick..Great blog entry. Love the content, layout and colors. Thank you kindly…glad you found it and best part, I found your blog. Best Labor Day movie, ever, Baby. Congrats on passing the driver’s test – that counts as something I would not want to do again (actually, there are a lot of tests on that list)! Thank you. I’m very glad it’s done, the driving is easy, but I freeze up on tests usually so I agree completely about not wanting to do it or other tests again. Oh, excellent – I will look up some bouquets! I like the regular yellow pencils, but I see quite a few people go with the coloured pencils. Cool. I’m a fan of the yellow ones as well – they just strike me as more pencil-like. Wow! You’ve had an incredible year so far! And I can see I’m in great company, so I’ll be sure to share this so others can find you and these amazing bloggers. And your questions are so awesome I had to answer. 1. Where do most visits to your blog come from? —Not very good on checking my stats, but I get a lot from WordPress and Twitter. 2. What is your favourite sport? —Soccer to watch and play. 3. What has been a special moment for you so far in 2015? —Reaching my 2 year blog birthday, passing my final driving test, and getting my first laptop. 6. Anything you had wished to have learned earlier? —Driving. I just had the time of my life reading this! Woo, my laptop runs on Vista as well, and it’s done me proud. It’s battery doesn’t hold a charge so it always has to be plugged in, it loses it’s Wifi connection every now and then and has to be restarted, and it’s lost 6 of its keys from the keyboard after my son got a hold of it, but I’ll almost be sad to stop using it. And congratulations on passing your driving test. I am backtracking on posts with many people I follow but never seem to get to. Sorry, I do notice your likes on posts and thank you! I love pop culture and some of the things you mentioned are what are right up my alley. Quirky movies and characters that stay with you. Have you ever watched Bates Motel? I got caught up with a friend which really was fun. The mother is Vera F. from Up in the Air film with George Clooney. I like Rectified, too. For sardonic humor and a really god reason for being “bad” the off the path movie of “Bad Words” with Jason Bateman in a kids spelling bee is really twisted but very good. This is all for yhe moment. Loved your references!! I am so happy you have been enjoying blogging which you have a great crowd of friends who are ago positive and supportive, D. I was going to ask you if you liked the “Imitation Game” with Benedict Cumberbatch and Keira Knightley? My family likes “Office Space” and recently 2 daughters and I liked Amy Schumer in “Trainwreck.” Enjoy your weekend! I like a lot of shows, books, etc. that many people have never heard of, but as long as we like them, that’s what counts, right? Donating stuff has always make me feel good. Truly, to give is to receive. Another great post! Thank you. Yes, I think of the world as a giant lending library, I like to think things are being enjoyed or needed not just sitting. I enjoy you so much! Thanks for the visit and the follow. I think I’ll return the favor. I need more belly laughs in my life! And I can foresee many more with you!! Welcome. Yes, I’ve already thanked her!! Oh girl! Where would we be without popular culture! Thanks so much for partying with us on #FridayFrivolity every week.